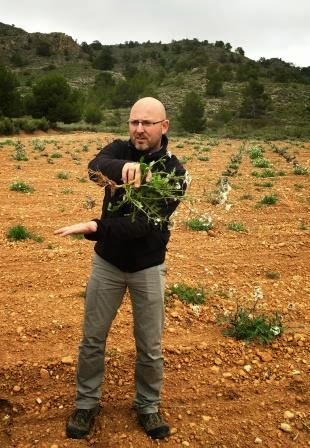 The Wine Wizards of Istria may be spectacular, but they have nothing on El Mago de Monastrell, Sebastien Boudon, who casts his spell over wine making for the MGW Group's efforts in Spain. In Spanish, "Mago" translates to Magician, but the term is also used for the The Three Wisemen (Los Reyes Magos), so in this context I mean more Gandalf than David Copperfield. 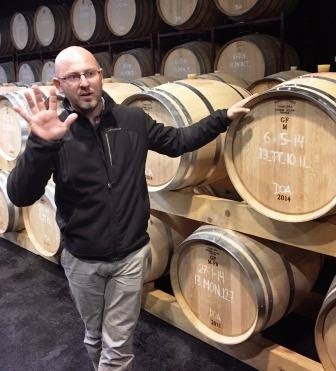 Sebastien hails from Bordeaux, where his family has been making wine for hundreds of years. Lured by the climate, the lifestyle and his wife, he relocated to to Spain where he lives about 55km from Bodegas Sierra Salinas in a town by the sea. He has been there for ten years now and affirms his love of the climate as well as the lifestyle. His affinity for the Monastrell variety is something we can all enjoy in the delicious wines of both Sierra Salinas and Lavia. I fell under the enchantment of both the Bodegas Sierra Salinas and the Lavia wines, neither of which are available in California. Sigh. During our trip to Spain, Sebastien was with us to explain wine making techniques and impart to us his passion for his wines. He is so enmeshed with the Monastrell variety that when a cache of very old Monastrell was found under the sea, Sebastien was one of the four people who got to taste it for sensory analysis. Does it age? It does! En Vaso in English means bush trained. I love the Spanish phrase, which translates directly to "goblet trained" and expresses the low round shape of the Monastrell vines. 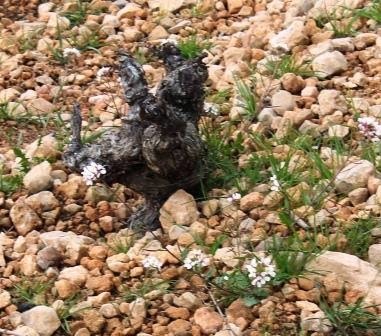 Sebastien said that old vines need to be loved to produce and we could see in all his care and joy that the vines get more than perfunctory care. They are cherished to coax out their two kilos of fruit per vine. 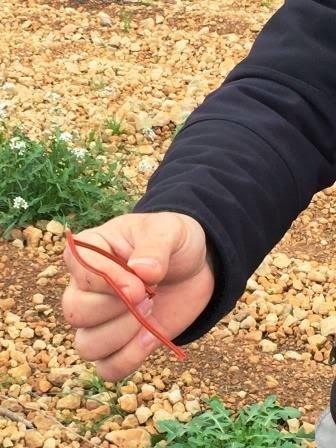 Though these have been dry farmed for many years, the last period of drought threatened the Monstrell vines and so now drip irrigation was recently installed. Survival is most important. Sebastien's wine making philosophy is to be super gentle. From the gravity fed arrangement to the tanks they use, the fruit is vinified with tender loving care. 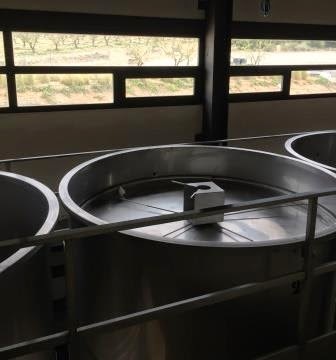 They cold macerate at 8 Celsius and select fruit in the field (hand harvesting has its advantages) They move it to double jacketed tanks with floating top stainless seals to prevent oxygenation. This both makes prefermentation easier and helps accomplish the submerged cap management needed to be very gentle. Pips can be bitter. This also helps them control tannin extraction. 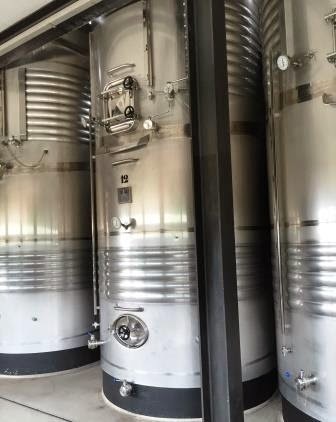 Using tanks with double doors, they can take the skins off without pulling it through the juice. 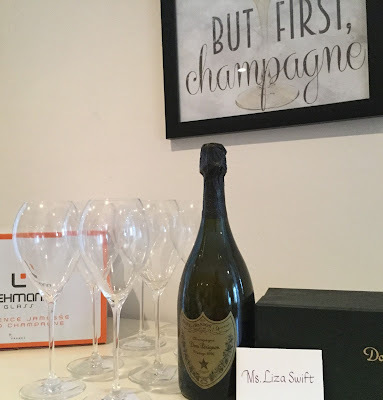 It is important to treat the entire harvest with care as they do not press out for second brand. They don't sell or buy fruit but rather focus on estate wines of quality. They have all the equipment so they let the wine dictate its own plan. Sebastien's words are seasoned with his native French. His stories are made more delightful by the passion in his demeanor and the hint of France in his accent. Nowhere was this more evident than in his wonderful explanation of his oak philosophy. He told us of French oaks of different forests and grains of wood. His preference is for Allier due to their fame for understanding and predicting. Why is French oak better? It's planted intentionally and organically, unlike the eastern wild forests. Planting is controlled so trees are very straight. Important as their original purpose was as masts of ships, so they needed to be tall and strong, with no knots. The trees are planted in high density so the rings are tighter and grain is right because they had to struggle. Narrow tight grains are expensive because the yield impacts the price of cubic meter of wood but also because of the wood guild that has been caring for the forests for hundreds of years. These friends of the forest have a commitment to sustainability rooted in commerce. Another factor of the uptick in price is the harvesting process. These forests are harvested with axes to follow the line of the tree, not with a chainsaw #work-out! French oak has different fiber so junctions need wedges to fit and reduces production rate, but yields a fine grain that is better for oxygenation and respects more the raw material. Sebastien prefers it because he detects more overt coconut and vanilla in American oak. Sebastien includes barrels of several sizes in his spice rack. Bigger barrels are used for more fruity wines as less oak contact means less oxygenation. He explained to us that different barrels sizes occurred to accommodate the different bottle sizes historically in France, e.g. Burgundy vs. Bordeaux, etc. Indicative of the fun we had on this trip, MGW Group director, Sergio Sachnovsky-Raevsky quipped, "And best of all with purchase of three hundred barrels, we got a wine maker for free!" What a deal! El Mago de Monastrell not only gave us an amazing primer on his wines, but also a delicious luxury product hand crafted with love and harnessing nature to express terroir in a bottle. And when Sebastien says terroir, he not only means it, but pronounces it correctly.